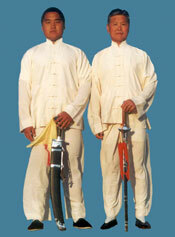 Taichi Grandmaster Tung Ying Kit was a native of Ren County of Hebei province. His original given name was �Wen Ke� and was later known as �Ying Kit�. He first started learning martial arts from Liu Ying Shou, a well known armescort. Later he was recommended by Liu to study under Li Zenhui, a student of te famous Taichi master in Guang Fu. 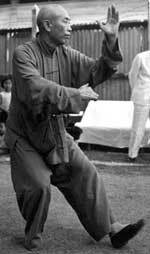 Subsequently for a number of years he also studied the Hao school of Taichi under Li Xiangyuan, a student of the well known Taichi master Hao Weizhen. Then he heard about grandmaster Yang Chen Fu, head of the Yang school of Tai Chi, teaching in Bejing. With great admiration, he set forth to become his student and learned very eagerly. 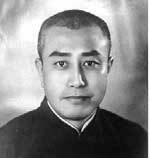 Yang was very pleased with him and took him along whenever and wherever he traveled to teach, setting up the �Zhi Rou Taijiquan Society� in 1926 in Shanghai, and the �Nanjing Central Martial Arts Gymnasium� in 1928 in Nanjing. In those 10 years, Master Tung was Yang�s chief assistant instructor. Master Tung not only excelled in martial arts, but was also a scholar well versed in literature and composition. He was the principal contributor in Yang�s famous book �Applications Of Taijiquan�, published by the Commercial Press in 1931. In recognition of this and other contributions, Master Tung was featured with a portrait photograph in the later book �The Surviving Works Of Yang Chenfu� published by Hua Press in 1987. In 1934, Master Yang was invited to teach in Guangzhou. He brought Master Tung and his elder son Shouzhong. Unfortunately, he had difficulty acclimatizing and had to return to Shanghai with his son. He asked Master Tung to stay and delegated the teaching to him. Sadly, the Grandmaster Yang died the following year. In 1936, Master Tung was invited to teach Tai Chi in Hong Kong where he established the famous �Tung Ying Kit Taichichuan Gymnasium� and extensively promulgated the Yang style of Tai Chi. In 1941, while the Japanese occupied Hong Kong, Master Tung moved to Macau and established another Tai Chi gymnasium there. He returned to Hong Kong after the war in 1945 and summoned his three sons, Hu Ling, Jinling, Jinbao to assist him in teaching Tai Chi. Based on the many years� keen learning, deep perception, and vast experience, Master Tung wrote the classic �The Meaning And Significance Of The Taichichuan Practice� in which he also introduced his own creation, � The Tung Ying Kit Tai Chi Express�. This book became an instant success and was well received widely. As his name spread far and wide, he became a legend in the art of Tai Chi and received invitations from all over the Far East. In his later years, he traveled extensively to Thailand, Singapore, and Malaysia, teaching and promulgating Tai Chi and setting up gymnasiums in the capital cities. His eldest son, Hu Ling, and later his grandson, Kai Ying, took turns to continue his teaching in these places. When Master Tung passed away in 1966, he left a legacy of high renown. This was fortunately capably upheld by his son Hu Ling in Hawaii, daughter Jasmine Mood Lay in Hong Kong, and grandsons Kai Ying and Zengchen in Los Angeles and Hawaii respectively � the latter two also making regular trips to various cities in Europe.